Paintings are sometimes described as a 'window into another world'. Some series, especially in video games, take this all too literally. A magic painting will contain an entire world or dungeon which the heroes must enter to defeat the enemies within. In some cases, the art style will shift to match that of the painting, emphasizing the otherness of the painting world. If this gimmick is used more than once, a magic art gallery can be the basis for the Hub Level of a game. In rare cases, some nefarious ill-doer or oblivious Muggle may attempt to destroy a Portal Picture while another character is inside the painting world. 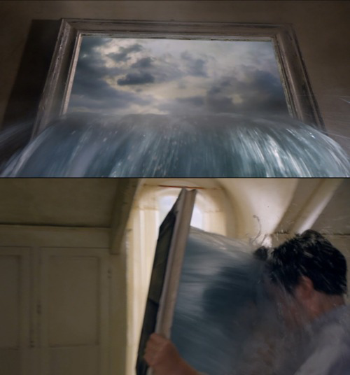 The results vary: if the painting was literally a portal to another world, then destroying the portal will leave the characters Trapped in Another World. The more common metaphysical position, though, is that the painting world is actually formed out of the paint and brushstrokes on the canvas, and by wiping away the painting, the world itself disintegrates. Either way, the painting may be used as a prison. Compare with Portal Book and Trapped in TV Land, for different mediums acting as a portal, as well as Mirror World for another flat, common object frequently used in fiction as gateways to different worlds. See also Art Initiates Life. C's world from Code Geass is not entered by a picture portal, but the memories stored there are displayed in a portrait gallery or library that can be entered. When the party are starving in Delicious in Dungeon, Laios jumps into a living painting to try and eat the food depicted there. He manages it, but when he jumps back out the food disappears and he's left hungry again. The Throne of Yord from Shamanic Princess appears to be a painting, and characters enter and exit a world within it...But the Throne of Yord is evidently anything it wants to be. In The Sandman, each of the Endless has a family gallery with which they can summon each other to their domain. Most appear to be picture galleries, but Despair has a Hall Of Magic Mirrors and Destiny a garden of colossal statues. Dziwne Przygody Koziołka Matołka: The episode "Złoty Szlak" features one in the form of a map. In Looney Tunes: Back in Action, a chase sequence in the Louvre involves several escapes into famous paintings. The Mary Poppins movie had a scene of this sort which took place in a sidewalk chalk drawing. The end sequence is interesting, as the background melts into blobs of color because it's started to rain, causing the chalk on the sidewalk to run, thus ending the characters' visit. Van Helsing has a Portal Picture. Night at the Museum: Battle of the Smithsonian allows characters to jump into (and out of) scenes in paintings during a chase scene. In Harry Potter, portraits cannot be entered, but their inhabitants can move freely from one frame to another, so long as they're close enough. In addition, a person in their own portrait can move to any other of their own portraits at will, and from there into any other portraits that are close enough. Olympus is accessible via a mural in Xanadu. The opening title animation for The Pink Panther Strikes Again has the Inspector tailing the Panther into a movie theater, then into the screen through several parody movie clips — he ends up trapped in the screen as the Panther watches from the seats. Played with in What Dreams May Come. What is being painted on paintings is created as reality in the Painted World of the afterlife. There is a short story called "The Rose Window" where a cleric (also the narrator) in a mild fantasy setting has a large rose window brought to his church from the one where he grew up. Then bad things start happening and members of the clergy start seeing something in the window move at night. Then the cleric comes to realize that something other than his god was secretly being worshiped in the church he grew up in. In the end he plans to smash it and then destroy his journals if breaking the window fixes the problem. The journal entries are what the reader (you) are reading right now. Rose Madder by Stephen King. His short story "The Road Virus Heads North." In The Voyage of the Dawn Treader, this was how Edmund, Lucy and Eustace got to Narnia: via a painting located in Eustace's house. Quite likely a homage to George MacDonald. The picture above comes from The Movie of the Book. The Chronicles of Amber had the "Trumps," which were most commonly the size and shape of Tarot cards, but people skilled in using them could mentally communicate (or combat) the individuals depicted thereon. They also facilitated travel across the dimensions, as either person could offer to bring the other through. Trumps could also depict particular locations, which made them handy escape tools. In the course of the novels, it is revealed that it is not so much the materials of which Trumps are composed as the skills of the Trump artist that gives them their powers: two are scribed onto prison cell walls and become significant plot points later on. Later on, we also find two main characters within a Wonderland (as in Carroll) bar that's being painted onto a wall by an artist. The point between reality and mural moves back and forth. in Harry Potter and the Deathly Hallows Aberforth has a portrait of his sister Ariana that functions as a portal between the Hog's Head and the Room of Requirement that is used to supply Nevile, Luna, and Ginny's reinstated version of Dumbledore's Army, allow the trio to get into the castle, and evacuate students. The entire premise of Crewel Lye is that the main character is reduced in size and transported into the world that is depicted in a tapestry. Another chaarcter, (fullsized and outside the tapestry) can follow his progress by watching him in the tapestry. A later book also involved a painting which transported the characters into the world of one of the author's other series. With a Single Spell by Lawrence Watt-Evans, though its portals depict locations elsewhere in the same world, rather than other worlds. Later books in the series show the same magic being used to transport to other worlds and back. The protagonist in George MacDonald's Lilith enters the imaginary world through a painting in the attic on one occasion. The painting portrays the moor where he winds up. One of the Land of Oz books mentioned a picture of a river drawn so well, that when the artist attempted to draw flowers on the other side, he fell in and drowned. The Angel tie-in novel Image does this. When a person is under the influence a certain type of magic, they can paint pictures that are portals to the worlds in the paintings. Site Kilo-29 , a secret nuclear shelter somewhere in the US, has, for whatever reason, a giant poster of the 2/19th, a US Army base in Germany where a demonic being nicknamed Tandy (after the guy whose body he likes to wear) hunted and killed the narrator's unit every winter for years. It appears that the poster is not just a portal but also the source of Tandy's power in Kilo-29. In Larry Niven's Known Space stories, Gil "The Arm" Hamilton has a limited form of telekinesis and remote tactile sense that manifests as an "imaginary arm". It's limited to the range of his real arm, except that he can also reach into a sufficiently realistic-looking video image and "touch" things near the camera. Sixty Eight Rooms: The rooms work as this trope with the painted outdoor scene backgrounds becoming the real world outside. In Moominpappa at Sea, Moominmamma misses home, paints picture of it and is able to go into the picture. "Chapter Two: A Day Out" of Mary Poppins is the inspiration for the chalk-drawing scene in the film, Mary and Bert the Match Man (but not Jane and Michael) enter one of his pavement sketches, where they have afternoon tea and travel to Yarmouth on merry-go-round horses. In the Malazan Book of the Fallen, Ganoes Paran finds ingenious ways to use his powers as the Master of the Deck of Dragons. He has an artist paint new cards to his specifications, then uses them to create portals to transport his army across vast distances, or to bait an enemy commander into another realm. In the Charmed (1998) episode "The Painted World", a demon is trapped inside a magical painting. Dead Gorgeous: In "Love's First Kiss", one of Rebecca's former suitors escapes from a portrait and traps Jonathan in the painting to take his place. Doctor Who: In"Fear Her", a girl has the ability to convert people into crayon drawings. Used in the last episode of Friday the 13th: The Series. A curse painting allows an obsessed history professor to contact the Marquis de Sade in the past, where the two exchange bodies of their victims. A Legend of the Seeker episode had a painter able to out any object or person into a painting just by drawing them on it. In order to get out, the painter had to paint the object or the person on a canvas from within the painting. In the Night Gallery episode "Escape Route", a Nazi war criminal on the run from the authorities in South America takes refuge in an art gallery. He discovers that with concentration, he can project himself into a painting and decides to use this to escape from his pursuers, choosing to enter a peaceful painting of a man on a boat. Unfortunately for him, he winds up projecting himself into the wrong painting, and ends up in a horrific painting depicting the tortures of a concentration camp. On The Office (US), Michael has left Pam with a list of excuses to give when he doesn't want to take a phone call. Her favorite, which she's saving for a special occasion, is "He's trapped in a oil painting." Once Upon a Time falls somewhere between this trope and Portal Book - in Season 4, it is revealed that The Author is trapped behind a door in Henry's storybook. An arc on Supernatural Soap Opera Port Charles involved Kevin being trapped in a painting by a magical candle. For him to get out, someone had to light the candle again. Red Dwarf did it in "Timeslides". Once the pictures (brought to life with mutated developing fluid) were projected on a screen, they were big enough to step into, for Time Travel fun—though you couldn't go outside the frame. In the Puppet Show Rimini Riddle, Aunt Vera owns a portrait painted by the protagonists' grandmother of two young Victorian girls on a beach. When the sister accidentally cracks the glass while cleaning, she finds herself inside the picture, where she meets the girls and a fisherman. In the children's program Zoobilee Zoo one of the characters ventures inside a picture made by her friend, one created with magic paint. When she starts hearing a crackling sound, she realizes the paint is beginning to dry, and races to get back out before she somehow gets sealed in. The classic video for Aha's Take On Me. The video of Enya's "Caribbean Blue." Also the video of Rick Springfield's "Don't Walk Away", although that one may have been a metaphor for the painter's imagination. Jason Mraz's "Not So Usual." Elton John steps into a wall-sized poster on the cover of Goodbye Yellow Brick Road. This Little Nemo comic features the eponymous character climbing into a bill-board being painted by some painters that features the ocean to go swimming. Unfortunately for Nemo, he becomes part of the painting (actually a water-safety PSA) and he becomes frozen in place in the picture as a boy in deep water without a life-jacket. Of course, it's All Just a Dream like many of the other messes Nemo gets into. SCP-105 ("Iris") is an 18-year old girl with the ability to turn photographs into portals to the area in the photograph as it is at that time. SCP-1674 ("Camera Obscura") is a large painting of an overcast rocky taiga (steppe-like) area. Anyone entering SCP-1674 will end up in another world that resembles the painting. Dreamlands boxed set, adventure "Pickman's Student". While dreaming, the PCs have to pass through several paintings into various parts of the Dreamlands. Masks of Nyarlathotep, adventure "A Serpent in Soho". The PC's can enter a painting and go back in time to when the Serpent Men ruled the Earth. A number of the Nano Fiction pieces in Nobilis are about these, such as "the Box." Dungeons & Dragons, Dungeon magazine #45 adventure "Prism Keep". In the title castle is a magical picture of a beach at sunset. The picture acts as a Gate to a distant land. Anyone who touches the picture is transported to the beach. Super Mario 64, the Trope Codifier, used paintings as the gateways to most non-hub worlds. Other gateways were located inside a model mansion in a small cage, an invisible portrait that only appears in the mirror in front, a seemingly normal wall, two small pools of water, a clock's face, a bunch of small wells, a trap door, and holes. In Super Mario Sunshine, Shadow Mario painted his M symbol on various landmarks all over the place and these became portals to levels. In Luigi's Mansion, Mario was captured in a portrait, and when you finish a big boss fight, you turn all of the major bosses you faced into portraits, the frame color depending on how well you did. Super Mario Odyssey brings back the paintings from Mario 64, this time as shortcuts between the various kingdoms. They're also used to refight certain bosses (from towers in the Mushroom Kingdom), to rebattle Bowser again (in the chapel on the Moon) and as part of the Brutal Bonus Level Culmina Crater (specifically, to access the part where you play as a captured Bowser). Castlevania: Portrait of Ruin had this as one of its gimmicks, allowing players to explore very different settings from the 'typical' environs of Dracula's castle. One of SoulBlazer's early dungeons was contained within a painting. In Atlantis II, stepping through a painting is a mandatory part of the Ireland quest. It's not immediately obvious that you can do that, though. The Legend of Zelda: Ocarina of Time, Phantom Ganon leaped in and out of pictures. In The Elder Scrolls IV: Oblivion, there was a side quest involving the "Painted World." Shadow Hearts: From the New World has its Bonus Level of Hell (okay, Purgatory) in a painting. Some of the MacGuffins in City of Heroes are exactly this. Being MacGuffins, we never see them in action. The linking books in Myst. The books have a picture window at the beginning which shows the user the world they will be linking to. Overlaps a bit with Portal Book since the book must have a description of the world it's linking to written in it, although it generally links to a place, not a story. In the Death Gate adventure-game, a skilled mage can use a painting to create a pocket dimension. Also happens very briefly in Poshley Heights in Paper Mario: The Thousand-Year Door. In Final Fantasy VI, the optional quest to find Relm in the World of Ruin involves fighting your way through an art gallery in a wealthy man's house. Most paintings come to life to attack you, but some can draw you into it, effectively acting as a portal. In Final Fantasy Record Keeper, the Record Realms are accessed by entering a portrait depicting a scene from a Final Fantasy game. A central point to Legacy Of The Ancients, where your character's begins the adventure by discovering a Galactic Museum filled with these. You do most of your traveling trying to get jewel coins to unlock and use the exhibits. The second Azada game does this with the illustrations in Expy versions of several literary classics. A plot point in Dragon Quest V, where a painting of a real-life scene allows the protagonist to travel to it... even going back in time. In Dragon Quest VII, one of these is key to reversing the "Groundhog Day" Loop a town is unknowingly caught within. However, it's only accessible when the heroes figure out how to trigger a complete time freeze. Dragon Quest VIII requires the party to pass through one to access its Secret Level, the Troll Maze. In Devil May Cry, there are several strategically placed paintings that serve as gateways floating in the air when you return to the castle. Pretty convenient, as several doors have disappeared. The primary setup for Drawn is Iris' ability to create these. Invoked in The Longest Journey, where April's dimension-traveling abilities seem to be tied to her painting talents. The first time she travels to another world without external assistance, she paints the place she wants to go until it turns into a Shift that takes her there. In the Interactive Fiction game Curses!, images projected by the slide projector are Portal Pictures. Nellie visits six worlds by jumping into portraits in the hidden object game Treasure Seekers 2: The Enchanted Canvasses, in order to rescue her brother Tom, who is trapped in the last world. In Ib, the titular character enters the painting world through a painting titled "Abyss of the Deep" and can leave it through another painting much later on. The main character in Blue Lacuna has the ability to draw a picture of a previously unvisited reality and then travel to it by entering the picture. The heroine of the Grim Tales series has the ability to enter photos or drawings that have something to do with her family. In The 7th Guest, this is the only way to enter and exit the Art Gallery. Access to it involves traveling through a rug that turns into a portal leading there, and a painting of the Music Room acts as the exit, with the frame expanding and becoming the room itself. Course, this just fits right at home with other, more bizarre transitions elsewhere in the house. Since all the passages have changed over time, the sequel subverts this by using the canvas of the painting as a door in the wall behind the frame. A movie-based example happens in Obsidian, where after a video of Max's memories reaches his nightmare of the Mechanical Spider, that segment jumps off the screen, fills your view, and thrusts you into that dream world. In Dark Souls, there is a giant painting of a rope bridge in the snow inside a large building in Anor Londo. If you have the right item (the Strange Doll found in your cell upon returning to the tutorial level), you can touch the painting and be sucked inside to the Painted World of Ariamis. In both Epic Mickey games, there are film projector screens showing old Mickey shorts on them. These screens showing the cartoons act as bridges of sorts from area to area. Haunted Manor 3: Painted Beauties has several paintings you can enter. Frogman's painting from Emerald City Confidential is a portal to his secret files on his illegal activities. The painting allows him to hide his books in plain sight. Shin Megami Tensei: Devil Summoner: Soul Hackers has a part where you need to enter different paintings in a virtual art gallery, in which Tomoko's soul has been trapped. 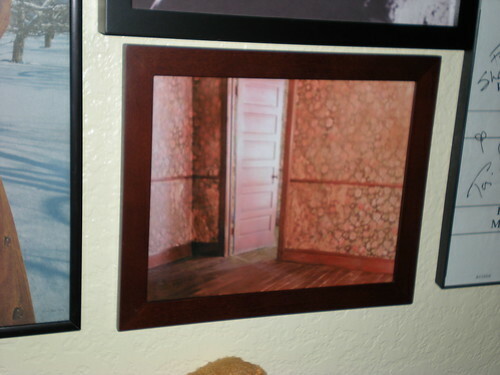 In Mystery Of Mortlake Mansion, the real-world mansion's pictures all become these in the "shadowy" version, with all of them looking into the same realm. Indeed, one set of pictures on the same wall in the shadowy hall all look out onto the same scene, as if they were simply panes in a large window. Persona 5: In the Art Gallery dungeon, the party can hop into paintings, using them to sneak around foes and reach alternate areas. In Snoopy vs. the Red Baron, you enter levels by flying through billboards in the Hub Level. The Maid of Fairewell Heights: Marshmallow enters the landscape picture world by being painted into it. In Avencast: Rise of the Mage, the player character discovers a set of portraits painted by a condemned mage, which transport him back in time to prevent the mage's execution. Gunnerkrigg Court: In "Schoolyard Myths", while wandering the old library, Annie and Kat come across a painting which has a set of footprints leading into it. minus. does it several times. Here, for example. Blue's Clues. In nearly every episode, the main characters "Skidoo" into a painting, book, drawing, or even wrapping paper for educational puzzle-solving. In The Movie, they even went into a sheet of music. "Blue Skidoo! We can, too!" Simon in the Land of Chalk Drawings was a 1970s British animated series (featured in the US on Captain Kangaroo, and later on the Nickelodeon series Pinwheel) which applied this trope to a chalkboard by way of a small boy's imagination. A similar premise was later used for Nickelodeon's ChalkZone. A Darkwing Duck villain, Splatter Phoenix, has a paintbrush that allows her to enter paintings, alter them, or create surreal helpers based on various art styles. The Chameleon from Super Secret Secret Squirrel did this with stolen paintings for recreation, until the titular protagonist subjected him to and trapped him within modern art. One episode of Jimmy Neutron had the Five-Man Band (With Betty replacing Libby) falling into an alternate dimension due to a long list of exposition that wont be typed here. The first room they enter is a stark white box with one of these on the wall. In a Dream Sequence in the Arthur story "D.W.'s Name Game," D.W.'s deer friend Walter tells her that Thesaurus "dwells beyond the woods." D.W. says that that's a long way away and asks him if he has a picture. He pulls one out and D.W. jumps into it, then breaks the fourth wall to comment "You didn't want to watch me walk through the woods, did you? That would be soooo boring." The Angel and the Soldier Boy was an incredible animation with no words, just music by Clannad. During one sequence a toy soldier and angel follow Pirates onto a ship that jumps into a painting of a sea scene. The Mickey Mouse short Thru the Mirror, a Shout-Out to Through the Looking-Glass. The 2013 short Get a Horse! has the movie screen itself as a barrier between a black-and-white cartoon world and our modern CGI world. In the Muppet Babies (2018) episode, "You Oughta Be In Pictures", the monkey from Sunday Afternoon at the Grand Jetee steals Fozzie's lunchbox, and the babies jump after it, hopping from one painting to another. One of the many legends about the Chinese painter Wu Daozi says that he did not die, but entered one of his astonishingly realistic murals and vanished forever.